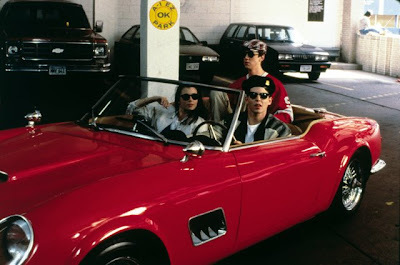 As Matthew Broderick's Ferris Bueller said in 1986-- he asked for a car and he got a computer. And for those of us who've been following his adventurous Day Off from the very beginning as it moved from format to format going from film to VHS to DVD-- finally like Ferris who became a wizard with said computer-- the technology geek in us can rejoice since he's made his way to Blu-ray. While--like Ferris who still longed for a set of wheels (before, of course, fast-talking his neurotic friend Cameron into “borrowing” his father's Ferrari above)-- those of us who already owned the DVD in Paramount's previous Bueller...Bueller...Edition will be a bit disappointed that none of the extras have been upgraded to high definition. 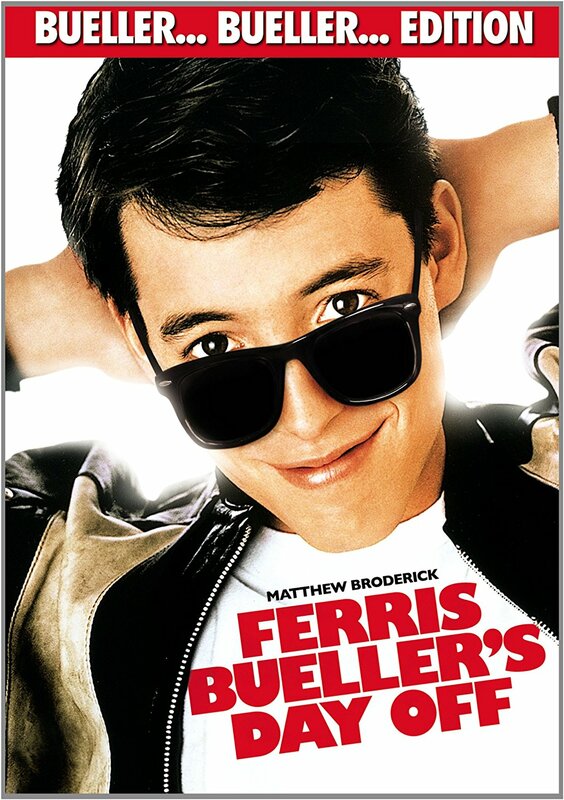 Likewise, it doesn't boast any new material that we didn't already have in the Bueller disc but aside from this, a main minus for me is that neither this edition nor its twin brother on DVD offered the reclusive John Hughes commentary track that had been available in its earlier DVD release. Instead of listening to the man who defined not only the pop culture of my youth but arguably our entire generation, we're stuck with old footage of Hughes circa 1986-- often wearing sunglasses and seldom very revealing-- as we find ourselves once again wistfully wondering just what exactly happened to the man who still writes but hasn't been seen or photographed in public for ages. In short, he's basically the cinematic equivalent of J.D. Salinger... except Ferris Bueller was nothing like Catcher in the Rye's Holden Caulfield. 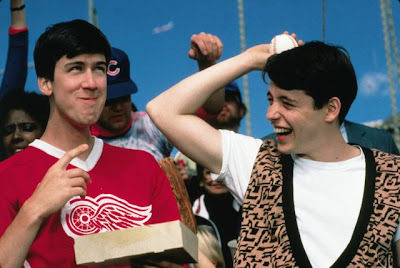 Essentially the embodiment of joy-- Ferris epitomizes that invulnerable feeling of being seventeen and believing that anything is within his grasp. And moreover, the great thing about his Day Off after he tricks his caring but clueless parents (Cindy Pickett and Lyman Ward and who actually married after filming) into "letting him stay home" from school is he has this magical way of achieving whatever lofty goal he imagines. A motivational speaker without the tacky gimmicks, Ferris is always successful-- whether it's securing that Ferrari, lip-syncing in a German-American annual Chicago parade to showstopping numbers including “Twist and Shout,” catching a ball at Wrigley Field, or perhaps most impressively and with the aid of Cameron-- coming up with a “believable” dead grandmother hoax to ensure that his lovely, elegant girlfriend, Sloane (Mia Sara) could be excused from school as well. While it would have been easy to play Ferris as self-satisfied, cocky, or smug as the casting directors note-- likewise pointing out that other than Matthew Broderick one of the only other actors who sprang to mind as someone capable of walking this line from the start was John Cusack-- Broderick manages to make him instantly lovable. No doubt bolstered by his Broadway background where he'd been starring in Neil Simon's Biloxi Blues opposite Alan Ruck who would be cast as Cameron (making their friendship on film ring with authenticity), his triumphant Golden Globe nominated turn is elevated via his stage-like ability to break down the fourth wall. Showing his great range and natural charisma-- Broderick manages to sell the hardest scenes in the work that go against traditional film set-ups of "ignoring the camera" by staring directly at it via several direct-to-audience monologues that invite us in to share the joke, be part of his ruse, and therefore make us feel that we have as much at stake as he does. Therefore, instead of just thinking he's a privileged jerk, we're invested and feel equally daring as he risks being caught by the ridiculously persistent Ed Rooney (Jeffrey Jones). Taking Ferris' absence personally and only falling for the trap of releasing Sloane in an elaborate hoax of epic proportions involving numerous answering machines and Alan Ruck's killer impression of her father (helping instill in Cameron the confidence that Ferris tries to the entire time), Rooney takes the day off from work as well. 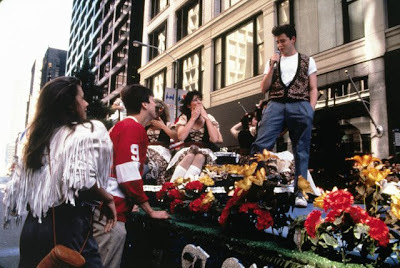 Although, whereas Ferris manages to live a near lifetime in a day of bliss, high-culture and fun, Rooney gets triple-kicked in the face, his car towed, stoops to more embarrassment and illegal activity and always-- predictably like Wile E. Coyote with Road Runner-- comes desperately close to catching the bold youth only for him to slip through his fingers each and every time. Of course, he isn't alone in his anger-- Ferris' enraged twin sister Jeanie (Jennifer Grey)-- tired of being the mistreated black-sheep of the family and always coming in second place to her Ferris worshiping parents finally ditches the school grounds herself, hoping to confirm the fact that he's faking firsthand and rat him out a.s.a.p. for the manipulative liar that he is. And typical for the work of writer/director John Hughes-- while the adults and especially the authority figures are often times cartoonish and overly broad-- he always cuts right into the psyche of the American teenager or more specifically, usually those who are lower to middle class and especially outsiders as popular kids who are rich are typically the villains, save for the sole case of Ferris. While as a child, it was easy to label Jeanie as a kill-joy or a jerk-- as an adult, it becomes far more apparent just how unequal the balance between the siblings was in that fictitious Illinois household. And indeed, while some would argue she got the better half of the bargain with the car verses the computer-- in a way, her parents gave her a vehicle to get the hell out of their sight whereas for the baby boy they coddle and still converse with in baby talk-- they gave him something guaranteed to keep him more indoors for all the good that does. It's ironic plot devices and seemingly throwaway inconsequential lines such as this that completely flew over my head as a child. And this time around, really analyzing it more than two decades later I could still truly feel her pain and greatly admired the way that Hughes allows her a few great moments of glory to cut down what could've easily been Jeanie's bitchy exterior that instead adds to her three-dimensionality. This is equally evident first and foremost in the delicious scene opposite Charlie Sheen at the police department when she flirts with the impossibly young star she'd brought to the attention of Hughes--having worked opposite him in his debut in Red Dawn. And secondly, inevitably it's a nice payoff when she becomes the one to save the day for Ferris in a generous act that displays that her brother wasn't the only one who received the great ability to think quickly on their feet in their shared gene pool. While the conclusion in the rivalry between the siblings seems a bit too easily concluded (admittedly one of the filmmakers' Achilles heels is extraordinarily complicated situations that are quickly banished with fast fixes such as in his other masterworks like Planes, Trains and Automobiles and The Breakfast Club), but the one character who still troubles me to this day is Alan Ruck's Cameron. While Ferris only pretends to be ill to enable him the freedom to go experience life-- Cameron's actual home life is so miserable with an overbearing father that he actually prefers to be ill. Although Ferris is convinced it's all psychosomatic and just in his uptight friend's head-- after Cameron suffers an extreme panic attack, becomes catatonic, and then makes a suicidal gesture in a sequence that feels like it goes on a little too long for comfort in changing the tone of the film to one of melancholy-- we're left deeply saddened by the contrast between the easygoing lifestyle of Ferris for whom everything seems to happen in a happy-go-lucky fashion (despite all the planning involved), when we glimpse him side-by-side with Cameron. And despite his Breakfast Club style speech that he will stand up to his father-- we're not entirely convinced that he's going to be okay or this will be the ultimate fix for his major problems that dangle just below the surface from the beginning of the work once the final credits roll. 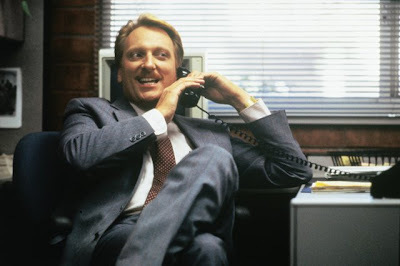 And indeed, Hughes has never one to shy away from taboo topics from suicide to domestic abuse to homelessness to bullying to class warfare even in what on the surface appear to be lighthearted comedies like Curly Sue or Planes, Trains, and Automobiles. Furthermore, although Hughes' oeuvre has been ridiculed and/or shortchanged by critics, scholars, and film fans as just simply consisting of teen comedies-- when you view a few of his works back to back-- you begin to realize there's some worthwhile messages being laced throughout the seemingly silly universes where adults and snobs are always outsmarted by precocious kids. A strong sense of blue-collar pride pervades his films from scripts like Mr. Mom to Pretty in Pink as well as his uncanny ability to tap right into what it means to be a child of the baby-boomers by analyzing how much things have both changed and stayed the same (to the benefit of both teens and parents alike). In my opinion, John Hughes is that rare breed of deeply underrated filmmaker whose work manages to transcend demographics as I honestly feel I spent the better part of my youth watching the works of John Hughes and always marvel when I catch one today and see the way that positivity, true heart, warmth, and the desire to be true to yourself, be just, be fair, and be considerate of others weaves its way throughout each and every one. While today there are countless studies illustrating the detrimental effects that entertainment can have on the young from desensitizing them or leading to violence-- I feel incredibly fortunate that I came of age in an era where the entertainment as offered up by Mr. Hughes helped shape who I am in the most positive of ways, opening up an ongoing dialogue both with my parents and my peers, and above all leading me into studying film with a keen humanistic eye. As, once we're faced with the humanity of the films of Hughes-- we realize just how much it's missing today in popular culture, therefore it's no wonder that when a few films manage to break through the mold of dumbed down expectations-- whether it's Almost Famous, Juno, Mean Girls or Clueless-- we latch onto them immediately. 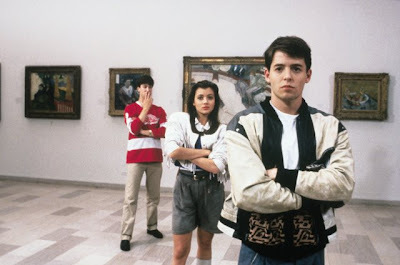 Likewise, despite the fact that while as an adolescent, I simply soaked up the euphoric sense offered by Ferris and repeated every line by heart, I'm now slightly preoccupied with analyzing the psychology involved and how it fits in with the rest of the films of Hughes. Additionally, I'm amazed by the way that a film which on the surface seems to be entirely all about joy manages to balance that out with some authentic pain (even if a few shortcuts are taken in their resolution to ensure it stays on track plot-wise) and felt it was a definite treat indeed to see the film in the highest definition possible. With enhanced depth perception and sharper clarity to further showcase-- as Broderick notes in just one of many excellent special features-- what a great job was done in the way the film was edited together, the picture is improved considerably. While the Chicago scenes were always quite impressive to begin with, now you're struck by the better contrast between the softer, muted colors of the school sets as observed in the sequence with the hysterical Ben Stein and the bright Kristy Swanson whose character Simone now nearly pops off the screen like another girl's bubble gum. And staying true to the source material by ensuring that we can now hear every single effect from the video game noise that indicates a failure by Rooney etc., the sound as a whole is especially heightened. Providing a fine balance between the music on the soundtrack with that of the dialogue which has been a problem on some of the Blu-ray transfers of older work-- you're also able to go as retro as you'd like in your selection on the audio menu from mono to 2.0 to 5.1 Dolby True HD. Although I'd normally say avoid the extras until after you've caught the film to avoid spoilers-- for die hard fans, they make a worthwhile place to begin the Blu-ray as you're let in on some great discussions of ad-libs, improvised lines, and changes that only enrich the viewing experience of a film we've come to love on each and every format since its theatrical release in '86.